Grit in the Gears: What is Wrong With this Picture? I wonder if any of you can spot what's wrong with this picture? Too easy. What other U.S. Spacecraft was named after Captain Cooks ship too? I see I'll have to try harder, if I want to confuse you all. 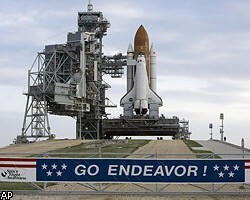 Though Tenon Saw is a bit non-specific, the answer was that NASA's banner misspelled their own shuttle's name. Max poses a further question, the answer to which I'll try to discover. Adullamite has been browsing a website of photos from my locality. It's a good one, but I don't go there often, because it's mostly of places I already know. I'll try to think of a blogpost, but I've been working, and sleeping, mostly, recently, it's been a very busy time. Methinks Tenon got the right answer for the wrong reason: Tenon is British and noticed the misspelling on the banner simply because he thinks Americans spell the word like the Brits. If I am wrong, I apologize. Stephanie is right (of course) about the Apollo 15 command module. I had seen the photo site of Leeds but lost it. Now I have it again. Thanks. I hope your brainstorming endeavors produce an exciting post. If we neglect to go to places we already know, they may change in our absence or disappear altogether.